Drager Alcotest 6810 Alcohol Test Kit is a handheld compact test kit for alcohol which makes breath alcohol analysis a simple process for professionals. 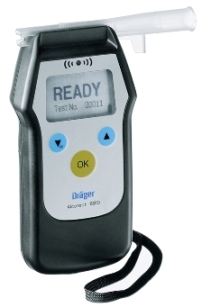 The 6810 provides alcohol tests quickly and easily and can print the alcohol test results on the Drager Mobile Printer. This alcohol test kit is easy to use for both right and left handed people and has a separation on the grip area that ensures a safe distance between the hand of the person administering the alcohol test and the mouth of the person being tested. Uses individually wrapped mouthpieces that rejects for safe removal.